Powerline Safety - Niagara On The Lake Hydro Inc.
Electricity is all around us and sometimes it’s in the unlikeliest of places. Keep yourself safe from electric shocks. While it may require more planning, it will keep you alive. Electricity can be deadly. Be safe NOTL. This happens more than you think. If you are the driver or passenger of a car that hits an electric pole STAY IN THE VEHICLE. Turn off the car, call 911, and wait for emergency responders to arrive and confirm it’s safe to leave. If a live wire is touching your vehicle, it is grounded by the vehicle. In the event that your vehicle catches on fire and you must leave then it’s not as simple as opening the door and running out. When a wire is touching the vehicle it is imperative that when leaving that you JUMP from the vehicle (feet together) ensuring that you are not touching any part of it when you touch the ground. If you’re touching ground and the vehicle at the same time you’re closing a circuit and risk your life. Any time you need to dig around your house and especially in the front yard you should contact ONTARIO ONE CALL to get a locate. You can protect yourself from harm but also can avoid disrupting your water, telephone, internet and other services to your home. Locate requests are free. Call toll-free 1-800-400-2255 or submit a request online. Never touch (directly or indirectly) an overhead power line. Even if it has fallen to the ground, it might be live. Maintain a distance of at least 10-20ft from a power line when using a ladder, cleaning windows/eaves or tree trimming. Stay at least 33ft away from a downed power line. If you’re in a vehicle accident and a power line falls on your vehicle. Stay in the vehicle until crews can deactivate the line. Never leave the vehicle. Do not cover transformers or plant anything around them. Having them open and accessible for service will protect hydro linemen. 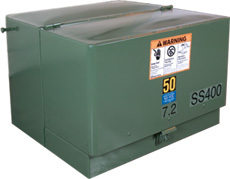 If you ever hear a loud bang from one of these, call 905-468-4235 and stay away from the transformer.